We have welders certified to American Welding Society (AWS) D1.1, D1.2, D1.4, D1.6 and ASME Section IX, B31.1 and B31.3 (pipe welding), and we have an AWS Certified Weld Inspector (CWI) on staff. 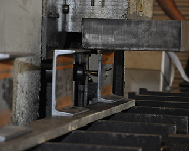 Our press brake features a 10-foot long bed and has a capacity of up to 150 tons. 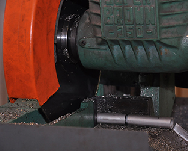 Our CNC Cold Saw allows for high production and precision sawing of pipes, bars, angles, and rods up to a 3.5” diameter. Our Horizontal Miter Band Saw can cut up to 16” in diameter or 16” x 22” rectangular profiles at 900 angles, or 16” x 15” rectangular profiles at 450 angles. Our plasma/oxy-fuel table can handle up to 5/8” thick stainless steel or aluminum and 3” thick carbon steel. Our ironworker generates up to 110 tons of force and can punch holes, slots and other shapes up to 3” in diameter, cope pipes and angles, and shear flat bar up to 24” wide. Other shapes that can be sheared, include a 1.5” diameter round rod, 3” channels and 6” x 6” angles. We have a 5 ton overhead bridge crane with a 45’ span and multiple forklifts of varying capacity on site. Our total lifting capacity is 18 tons. 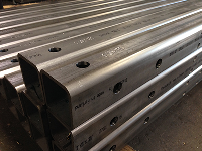 Primarily for small plate and bar rolling, our plate rolls can handle up to ¼” thick and 20” wide carbon steel or up to 3/16” thick and 20” wide stainless steel. Our plate shear can handle ¼” thick by 10’ long carbon steel and 3/16” thick by 10’ long stainless steel. We maintain a tractor with a 48-foot long flatbed trailer that will handle loads up to 48,000lbs. 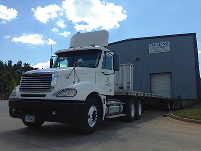 We also have a 30-foot gooseneck trailer for loads up to 12,000 lbs. We have a Manual Lathe with a 12” swing and a 40” bed length. We also have two Manual Mills, both with 10” x 48” beds. We are also equipped with conventional spray and airless painting equipment, media blasting with a 500lb blast pot, and a 50-horsepower rotary screw high volume air compressor. For more information or to inquire about specific capabilities, please give us a call. The Stone Mountain Park Laser Show is an iconic Atlanta experience. Have you been? Next time you’re there, check out the laser light and sound poles used for the Stone Mountain Park Laser Show, fabricated by us.